Neuchatel is a pleasant city with a medieval center situated in the middle of vineyards on the shores of Lake Neuchatel, the largest lake located entirely in Switzerland. Above Neuchatel, roads and train tracks rise steeply into the folds and ridges of the Jura mountain range – a wild and hilly country characterized by remote, windswept settlements and deep, rugged valleys. This is also the heartland of the celebrated Swiss watchmaking industry and known as the Swiss Watch Valley. Neuchatel’s atmospheric Old Town is extremely attractive, and random wanderings through its steep alleys are as good a way as any to appreciate the golden beauty of the architecture, as well as the 140-odd street fountains, a handful of which date from the sixteenth century. Alexander Dumas, the well known French writer once said that the pale ochre houses were caved out of a pat of butter. The highlights of the Old Town are poised on the very top of the hill: accessed by a steeply winding street, the Collégiale Church, begun in 1185 and consecrated in 1276, is a graceful example of early Gothic. Neuchâtel has several excellent museums such as the Laténium, an archeology museum focusing on the prehistorical times in the region of Neuchâtel; the MEN, an ethnography museum; the Musée d’Art et d’Histoire; and its star attraction, the astonishing Automates (Mechanical Figurines) of Jaquet-Droz. More attractions and activities in the Neuchatel and Lake Neuchatel region. Neuchatel, also referred to as Neuenburg is situated in western Switzerland on the northwestern shores of Lake Neuchatel at 430 m (1,411 ft) above sea level, just 20 km (12.4 miles) from the French border. The city also is the capital of the Swiss Canton of Neuchatel and belongs to the Jura - Watch Valley Tourism Region. 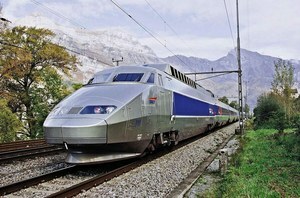 Geneva-Cointrin is the nearest international airport easily reached in 80 minutes by direct train. Zurich-Kloten Airport is reached within 110 minutes by direct train, as is the EuroAirport in Basel-Mulhouse. The Bern-Belp Airport with some international flights is within less than one hour driving distance (approx. 80 minutes by bus and train). Numerous direct trains from the major cities in northern and western Switzerland stop at Neuchatel's railway station providing easy access. Also the international highspeed TGV train Paris-Geneva-Bern stops in Neuchatel which makes the journey to/from Paris less than five hours. Neuchatel is situated on the A5 Motorway which connects to the A1 Motorway either along the western shores of Lake Neuchatel near the town of Yverdon in the south, along the western shores of Lake Biel near the city of Solothurn in the north, or via the Main Road to Murten in the east. 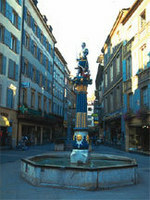 Thus, Neuchatel is easily accessible from all major destinations in Switzerland.